The Eclipse™ OWB “Outside the Waistband” Tactical-Light Holster was designed to allow the carry of a firearm with a Tactical weapon light attached securely on the belt. 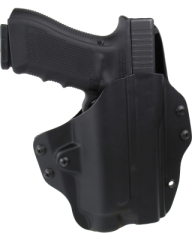 It is a Pancake style holster with a full sweat guard designed to ride close to the body making it highly concealable while still allowing for a full combat grip and a smooth, lightning fast draw. The Level 1 friction fit locks your firearm securely into the holster with our signature Blade-Tech click. The ultra-thin .080 construction make it a very comfortable, low profile holster allowing it to be carried undetectable without printing when wearing minimal attire despite the extra bulk of the attached light. The generous sight ramp will not snag or hinder the draw stroke of the firearm no matter what type of sights you are using. The Eclipse™ holster will not collapse making re-holstering the firearm with attached light quick and easy. Buy one today and CARRY CONFIDENT! Positive Lock Trigger Guard™ with a Level 1 Friction Fit with an adjustable tension screw. It is interchangeable with Precision Fit Belt loops that are available for 1 ½” & 1 ¾” belts. Made of thinner.080 material it is highly concealable being contoured for comfort. Pancake Style Holster that offers a smooth, quick draw from concealment that will not collapse, making sightless (low light) re-holstering quick and easy even with a weapon-light attached.